Are there dishes or certain foods you would love to eat all the time but can’t? In my home, I would eat more pork, salty goodies and of course, chocolate. Then there’s my husband who would gladly eat shellfish regularly (me too) but there is a small problem. It seems that all he has to do is catch a whiff of crab or shrimp and his cholesterol level skyrockets. My husband is one of the fittest people I know; sadly he has been dealt with a genetic card that requires us to be mindful of his cholesterol intake. It’s at a healthy level mind you (no medication required), what with his strict excercise regimen and the fact that I rarely serve beef or shellfish at home, but it does encourage me to be a responsible cook. But some days just call for throwing caution to the wind, especially when much of our diet consists of rice, vegetables, tofu and salad. Never mind the fact that I am baking more since the start of this blog; much of the sweets I make are given away to neighbors or office mates. We taste and pass the rest on. I’m glad that when it comes to savory dishes, I can exercise a bit more portion control when planning a meal. As a treat, I bought some prawns and marinated them in sumac, lemon, chives, chili flakes and garlic. After grilling them then taking the first bite, we were delighted by how flavorful the prawns were. The sumac is bright and lemony; its mildly grainy texture also acts as a coating to the juicy, just-cooked meat. 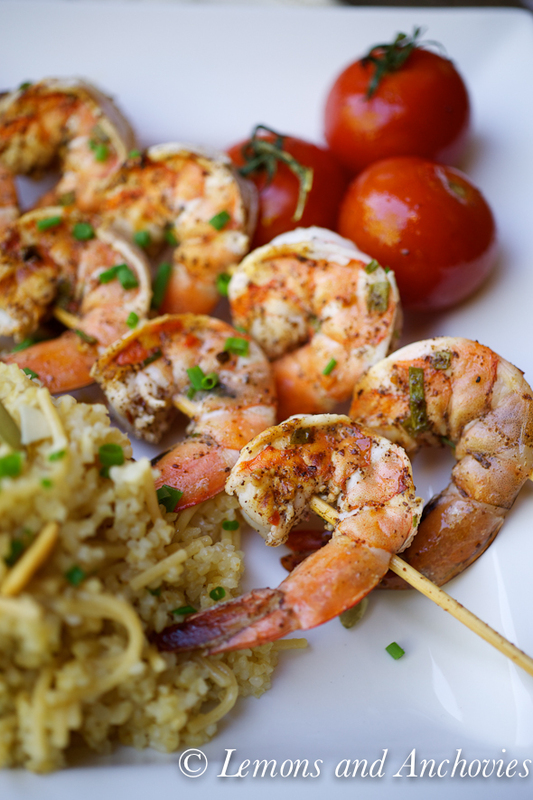 I served the prawns with simple grilled tomatoes that I tossed in the marinade (set aside before using on the prawns) and a large portion of bulgur pilaf. I have taken rice off my diet temporarily and I admit that after a few weeks, I’m missing it a lot. I was inspired to prepare my simple rice pilaf dish with bulgur wheat instead and wouldn’t you know, I thought I was being quite the creative cook for thinking of this. A quick Google search bursts my bubble as the pages-long search results mock my lack of originality. Still, this was one of the best meals we’ve had in a while. We treated ourselves to a simple, balanced meal anchored by the rare treat in our home that is called prawn. Marinate the prawns for 10-15 minutes. Don’t leave them in the marinade too long or the acidity from the lemon will “cook” the meat. Note: You may want to start the pilaf before you marinate the prawns. You should also preheat your grill at this time. To grill, place the marinated prawns on skewers, about four in each, and grill on each side for 2 minutes. The cooking time may vary depending on what type of grill you use–I used a cast iron stovetop version and I took them off the heat as soon as the meat started to change color. It’s very important that you do not overcook the prawns or they will be dry and rubbery. I grilled the whole tomatoes alongside the prawns. You want them to just long enough to heat through–when the skin starts to tear, they’re done. Heat the olive oil and butter in a pan over medium-high heat. Once heated, add the pasta pieces and toast for about a minute. Next, add the bulgur wheat. Just cook them in the oil/butter for a couple of minutes total until they get some color. Add the stock, bring to a boil, cover the pan and reduce heat to a simmer. Depending on the size bulgur you use, yours may take less or more time than mine. I purchased mine in the bulk food aisle at Whole Foods and it took about 20-24 minutes to cook. Once the pilaf is ready, add the lemon juice and toss in some chives and/or pumpkin seeds if you decide to use. I can’t do shrimp or shellfish for health reasons either – due to allergies (not mine). This looks SO elegant and delicious. I’m getting quite into sumac too, so it sounds just wonderful. 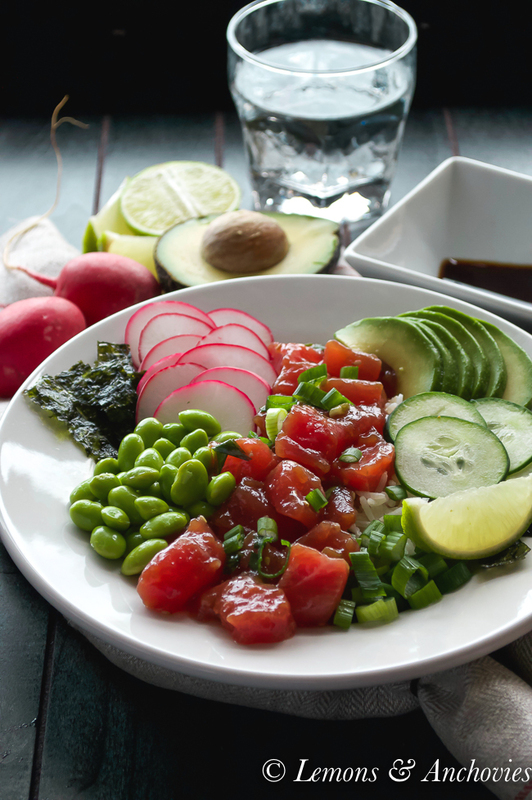 This is a delightful meal, perfect for a warm day, light and nutritious and full of flavor. Jean – this looks and sounds supreme! Very healthy and tasty too – that is the winning combination. I have yet to cook with Sumac – now I need to explore using this. Love Mendacino – did you guys fly? I am always amazed by the pure gold building that you see while flying over to Mendacino. Hope you have a great weekend and look forward to getting together soon! Happy Thursday! Oh, you’re talking about that Buddhist temple, right? It’s quite an amazing sight. We did fly but it was a very short trip. 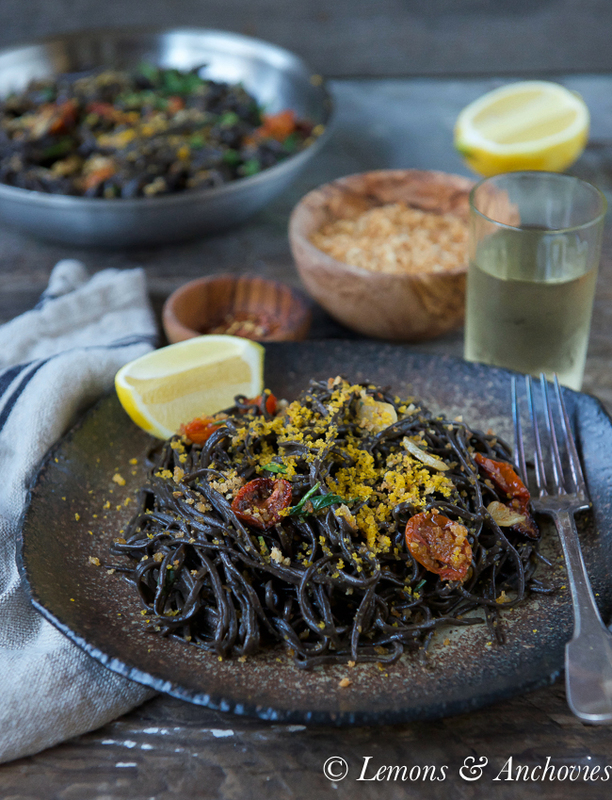 Lisa, I think you’ll enjoy cooking with sumac–it works so well on a lot of things. what a perfect meal going into the warmer weather! I love the bulgar pilaf, especially with the bits of pasta added in! I can’t wait for our fresh produce to start, I do miss really good jersey tomatoes! This is just the kind of summer dish that I love! Can’t wait to give it a try! You really know how to make me get so hungry!!! Well I don’t know about the cholesterol level but my adrenalin level has gone up for a start just staring at these gorgeous photos! Looks stunning, healthy and full of flavours. I really have to look out this sumac! Too bad he can’t have too much of this…I’m glad to help out, you know. I am not happy that I visited you at this hour and on this post, for I am starving! and craving this. ALL my favorite things are in here. I could have prawns 365 days a year and can’t get enough of sumac or bulgar. My goodness, i can actually hear my tummy sing at the thought of this meal. Have to do something similar for next week’s meal. Splendid. hubby would eat shellfish every day of the year is I cook it. 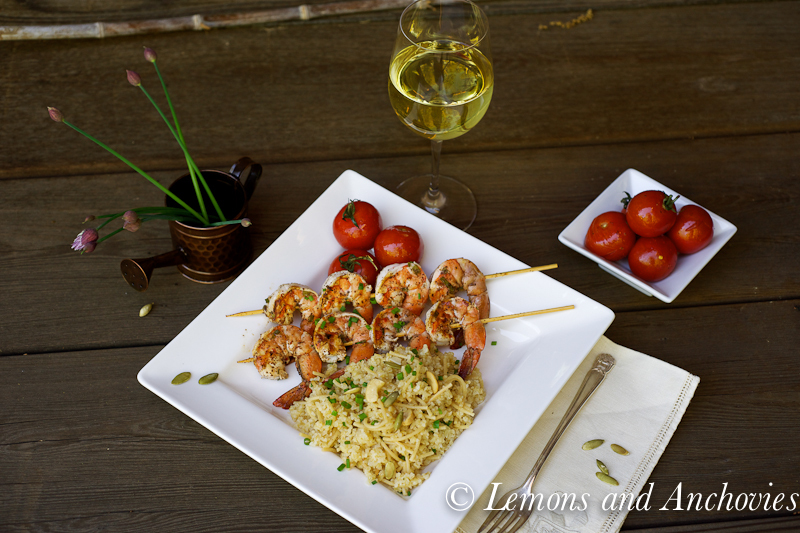 I rarely eat fish and almost never shellfish, but I have to say your skewers with the marinated shrimp tempts me. I love bulgur, actually prefer it to rice since I find it sweeter and easier to cook. I never knew shellfish was high in cholesterol! Im going to have to make sure that my dad knows (not that he watches what he eats at all). These skewers do look rather tasty! I used to not care for shellfish but when I got older, I loved them… BUT here’s the kicker I should be watching my cholesterol already at this time.. sigh! and oh I should follow your lead that I should start giving to my neighbors when I have some baked goodies instead of putting it around my waist haha. Loved your combo meal… makes me want to have it for this weekend. Oh wow! I can’t stop staring at those prawns and tomatoes. This dish is amazingly beautiful and delicious looking. Thank you for sharing. What a beautiful Summery dish! 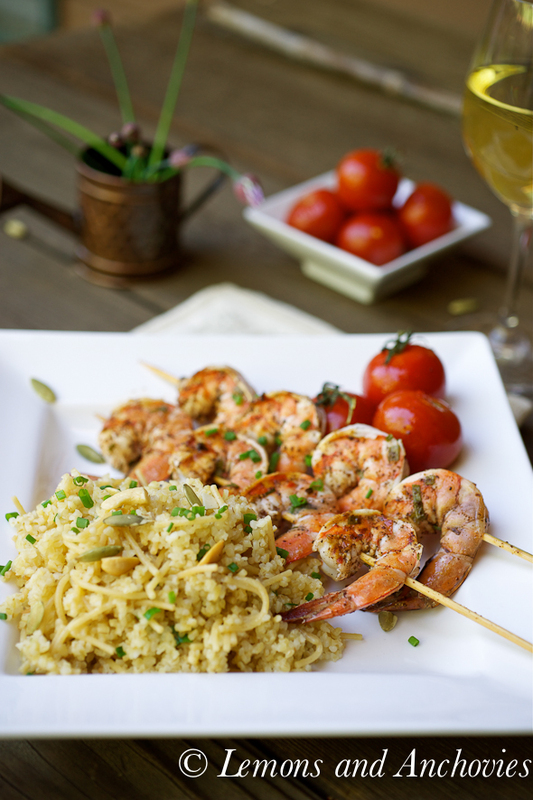 The bulgur pilaf is the perfect side for the prawns. Lovely presentation too. An absolute beautiful dish. 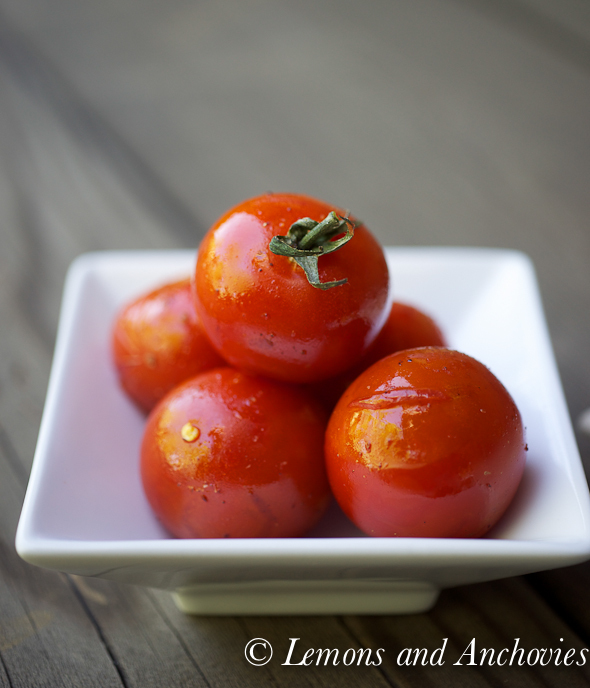 I am craving big juicy Jersey tomatoes now! I’m a Marylander now so I have the shrimp covered, just need some gorgeous tomatoes. There is a little stand on the way to the beach where I load up, warmer days can’t get here quick enough! Thanks for sharing. Hi Jean! I MUST cook this whole meal. 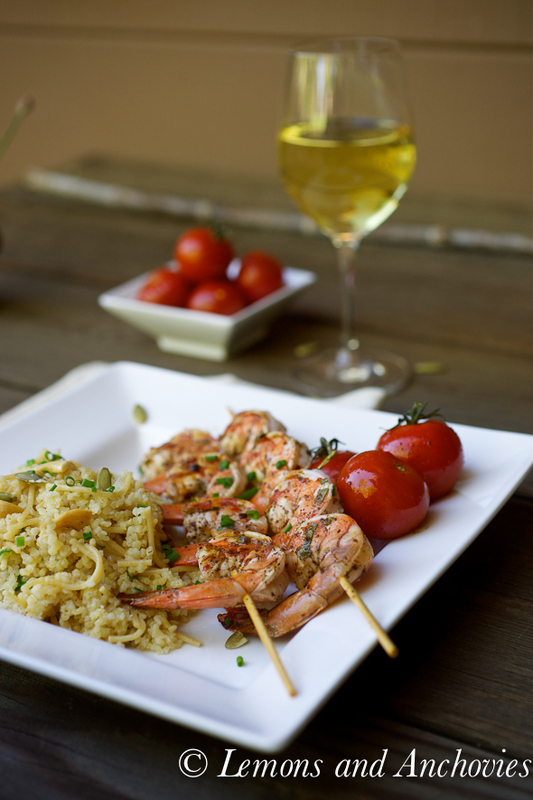 Both prawns and pilaf look amazing and it looks soooo good. Your photography is very beautiful too, but I know it’s not just because of the picture! I love how you prepared the shrimp. One question – where can I find sumac? Like whole foods or some Asian store or even American store?? Looking forward to try this! Very soon! This whole recipe looks great, but those tomatoes are really killing me! Wow, talk about the money shot! :-p I love those pictures of the skewered shrimp and the rice and wine in the background. So beautiful and totally captures the essence of the moment. Love it. I just cooked with shrimp today, too. So simple but such the delicacy! 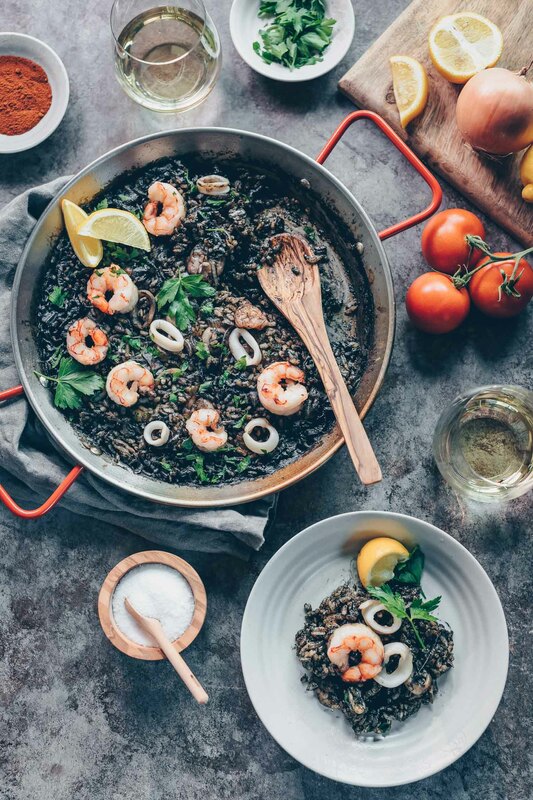 I love bulgur pilaf and prawns but never thought of serving them together… Thanks for sharing this brilliant combination! BTW your the photos are gorgeous. Wow they look so mouthwatering! I love seafood.